Where is it and why? Valladolid is a small city (more like a large town) in the Mexican state of Yucatán. It’s about 100 km/1.5 hours to Tulum, about 2 hours from Downtown Cancun, and maybe a bit more than 1.5 hours to Merida. It’s in the middle of the peninsula, not on the sea at all. I chose Valladolid as a starting-off point of a 6-week trip through Mexico mainly due to one reason: we were flying into Cancun, and I had no desire to stay in Cancun, so I looked around for places – in particular places that weren’t the super-obvious choice (eg. Playa del Carmen, Isla Mujers) – that would offer me something different. I’ve been to beautiful Mexican beaches before, I’ve seen great Mexican cities and mountains and towns … I was after sun, warmth, a different type of culture, and access to nature and swimming. I also wanted to keep this as inexpensive as possible. I knew that later on in my trip we’d have plenty of time for beaches, so beach was not a priority for me at all. New, different, interesting, and sunny, not far from Cancun. That’s what I wanted – and Valladolid was perfect. How we got there: We took a looong flight from Amsterdam –> Cancun on Condor, an airline I’ve flown with before. It was fine – unremarkable enough. From the airport in Cancun we walked over to the ADO bus area (which is within the airport grounds) and bought a ticket to the downtown Cancun station (about 30-40 minutes). After one night in Cancun, we rented a car and drove to Valladolid. Where we rented our car: It seemed pretty difficult/expensive to actually rent a car in Valladolid, so we used Tulum Car Rental in downtown Cancun. Their service was great in the sense that there were no surprises with hidden costs, everything worked, and the people were friendly. I would absolutely use them again. We spoke Spanish in person, but I made the reservation and communicated about pickup times in English with no problem. The road from Cancun to Valladolid: Amazing. There’s zero need to take the quota (toll) highway – go for the libre (free) road. Compared to other parts of Mexico, the roads felt like… well, like not an issue at all. On the free highway you pass through some little towns where you can stop and eat, and it’s green and lush and flat the entire time. Perfectly safe and very easy. Where we stayed in Valladolid: The beautiful and amazing Hostel la Candelaria. I booked through Hostelworld, which is where the link will take you. We aren’t really hostel-dorm-room types anymore, but I still like staying among groups of younger or like-minded travelers. The private room on the upper floor of this hostel was the best of both worlds for us – we had privacy (though we shared a bathroom, which was no problem) when we wanted it, but we could hang out in the beautiful garden and chat with other people when we felt social. The free breakfast every morning was delicious, the location was perfect, the employees were great, and the other guests were fun. Our room had two strong fans (I love sleeping with fans over an A/C). Wifi didn’t reach our room, which we didn’t care about (it worked fine in the garden and common areas). There were sinks to hand-wash clothes and a clothesline for drying. The water temperature in the showers fluctuated, but when I’m in a warm/hot climate, I really don’t care so much if I take one cold shower (it was mostly fine though). And as a nice plus, the guests of the hostel weren’t just limited to the under-22 crowd – there were at least a few other over-40’s there, and everywhere in between. Impressions of Valladolid: We stayed for four nights, which felt like the perfect amount of time. Valladolid is tranquilo. Ask locals what they think about it? “Tranquilo,” in the most positive sense. Tranquil. It’s chilled out. It feels incredibly safe. I didn’t experience or see any problems with traffic. There are a ton of female police officers/traffic cops. Bike lanes – real, legit bicycle lanes – run in and out of the city. People walk and cycle easily. I don’t think I heard a single dog barking at night or fireworks popping in the streets. If I had only ever gone to Valladolid in Mexico and stayed for 4 nights (and I didn’t read the news), I would leave not having any clue that there is terrible poverty and violence and crime in Mexico. 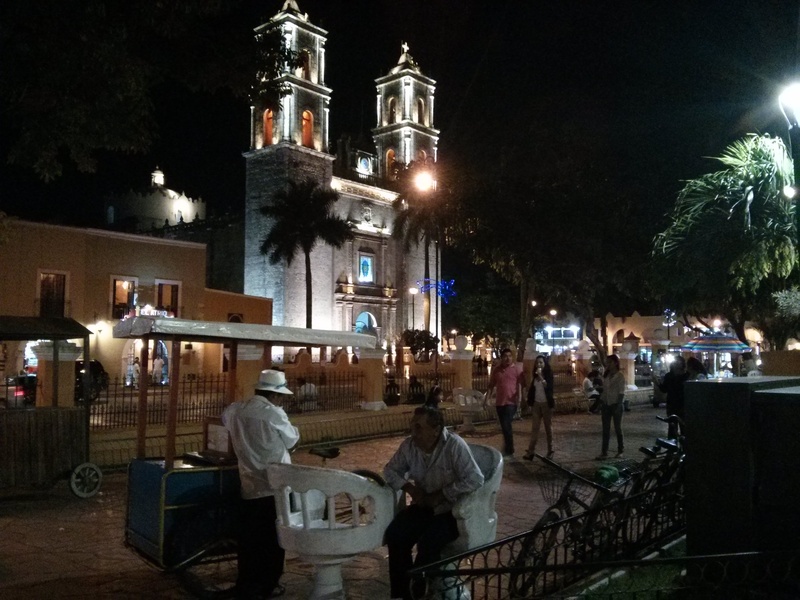 My fiancé grew up in Mexico City and has traveled pretty extensively throughout Mexico, and he said Valladolid was like no place he had been before. Tranquilo. Everything just seemed to work. You hear the Mayan language, eat Mayan food, get tempted to buy Mayan clothes, and see Mayan people all the time, all over the city. The indigenous culture is everywhere, and not just on display for tourists. It just… is. Outside of the city there are Mayan villages all over the place (we were lucky enough to visit Xocen one day and spend some time with a family there). If you want to hear and see and explore an Indigenous culture in Mexico, Valladolid is a perfect place to start. So what is there to do in the actual “city?” (it’s more like a large town, not really a city) Well… not much in the actual city, outside of shopping and eating and wandering. I guess that would be the down side, though it didn’t matter so much to us. We did find one super raunchy, fun bar where the beer was cheap, the crowd was clearly very, very local, and some (or maybe all) of the women probably didn’t present themselves as women during the daytime. We got some looks when we went in – you know the looks you get when you’re the only couple that is clearly not from the area and everyone inside knows everyone? Those looks. But I grew up in a small town, I know those looks. I’ve probably given those looks at some point. Anyway, it was completely fine after 3 seconds and we each drank a few beers.. Another night we found a different cantina with super friendly people. I mean, in general Mexicans are friendly and nice people, but these guys were just… the epitome of warm, friendly, and helpful. I liked both places, but kinda preferred the raunchy place. We gave it a half-hearted shot, but didn’t discover any real nightlife options. The city was pretty dead by 10pm, but there were always people hanging outside at the hostel. And I’m guessing if we cared more, we could have found more action, but we were more, well, tranquilo. If you go to Valladolid, you should go there thinking it’s a place to unwind and relax. Enjoy the weather, eat the food, and most of all: get on a bike or rent a car and go swimming in cenotes and hike through Mayan ruins. It was super easy with a car, but even if we didn’t have one, we could have easily gotten to at least 6-7 different cenotes just by bike alone. After one day, you’ll most likely already be in the habit of waking up by 7am (to the bright sunshine), doing active stuff all day, and being exhausted by 10pm. My normal routine is as opposite from this as is possible, but I fell into my Valladolid routine happily and easily. There were definitely tourists in Valladolid, but it didn’t feel like a heavily-touristed area. I think tour groups will come by on buses in their “let’s explore Yucatan” tour groups and stay for a couple hours and then leave again, which is an absolute shame (for them). Because the city isn’t on a beach, I think it gets overlooked – and this is crazy to me. 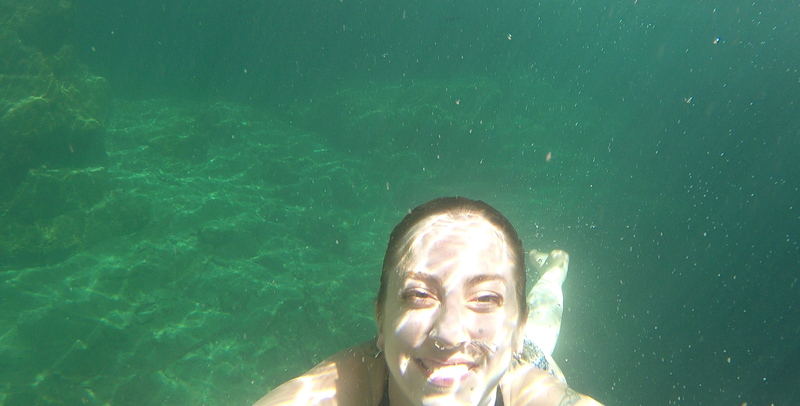 You could be at a beach in 1.5 hours if you wanted, but also… cenotes! I’ll have another post all about cenotes, but seriously, if you want to swim, swimming is everywhere. Nature and ruins are so easy to get to. The food is way better and way cheaper than you’ll find in crappy touristy restaurants in the beach towns. If you want to buy beautiful, artisanal clothing or hammocks or anything like that, it’s all over the place. So listen up, especially east-coast Americans and Canadians that have to suffer through another terrible winter and are within a cheap flight/not too far of a distance: in December, I was wearing shorts and sandals, swimming every day, hiking through lush forests, and eating amazing food in an incredibly safe, chilled-out environment. Go there for a week. Recover you vitamin D deficiency. Eat ice cream as you stroll down the street at sunset, happily tired from swimming and hiking and being outside in the sun all day. It’s literally 2 hours from Cancun and buses go from Cancun –> Valladolid all the time (or rent a car). And remember: bring your underwater camera.